Friday evening I headed to Rochester dreading feeling very uncertain about the 50k race the next day. I didn’t feel prepared because I’d found a lack of motivation and fresh legs since running the Wisconsin Marathon five weeks earlier and the Med City Half Marathon two weeks earlier. The end of the school year had me tired and stressed, too. When I got to packet pick-up I was disappointed to find out they had packed up early. I had arrived fifteen minutes before the end time, but left without my packet. Next stop-the nearest grocery store for some breakfast items and snacks. The nearest option was not my favorite…Wal-Mart. I learned some great parenting tips for future use by the woman who yelled at her screaming kids “I told you all to shut your f8#$ing mouths.” Awesome work, Mom! From Wal-Mart I headed to my hotel. The hotel turned my frustration around a bit as I had a room on the second floor right by an exit where I was able to park my car three feet from the door. 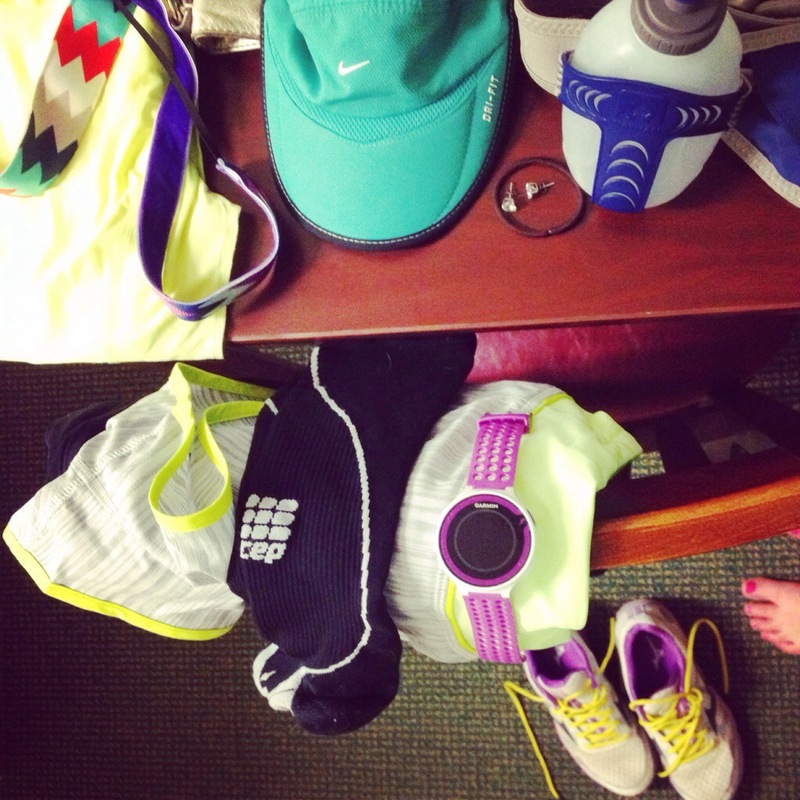 Then it was time lay out my race gear and have a snack and some hydration before bed. As I snacked away watching It’s Complicated (love that movie) I was going back and forth between the live feed of the WIAA State Track and Field meet checking in on some former students of mine (they rocked their events) and reviewing the 50k course for the first time. I didn’t have much time though as my alarm was set for 4:45 a.m. Yippy skippy! The alarm went off at 4:45 a.m., and since I figured I’d be running for 5.5-6 hours I knew I needed to eat more than on a regular race day. I ate a bagel with cream cheese and a banana, dressed and got on the road. 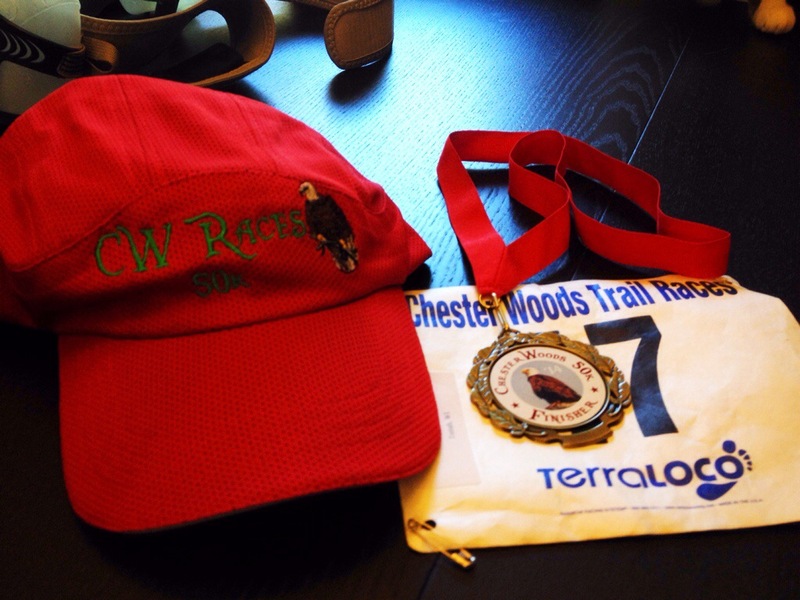 The race was only minutes away from my hotel and located at Chester Woods Park. Upon arriving I didn’t have the five dollars to enter as I wasn’t aware of the entry fee, but they were friendly enough to let me in and pay after the race (thank you, thank you) which I did. Karma people. After grabbing my race bib and chip I had time to run to the rest room and get my gear on. I was running with my fuel belt. Each bottle was filled with Grape Nuun. I had four Gu’s in the pocket of my fuel belt. My plan was to fuel for this race just like a marathon. If I was getting hungry or the Gu’s were not enough I came prepared with Auntie Anne’s Cheddar Bunnies, a granola bar, a Snickers bar, a Bearded Brothers Bar and a Kind Bar. Why so much? I wanted to have what sounded good when I was twenty-some miles in. And there really is no way to predict what would sound good so I came prepared. I knew the course was a three loop mix of terrains, but hadn’t really spent a ton of time researching the course. 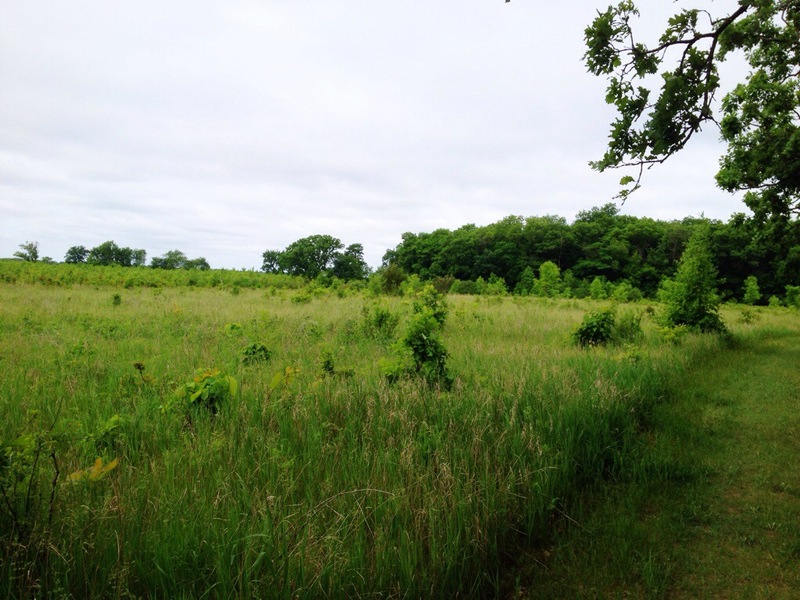 The first few miles took us through a meadow like area. Meadows are my least favorite to run on because the ground is uneven and grass can hide this. Later in the day the sun also shines bright in an open meadow. Lucky for us that the biggest section of meadow was early on. Thank you race director! 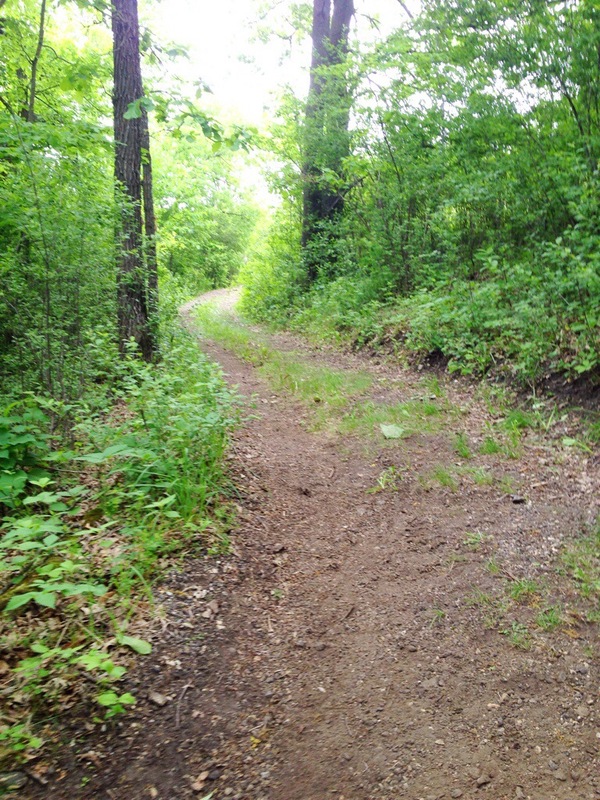 We then headed on a gravel road that led to a wood chip trail and then a packed dirt and grass trail. 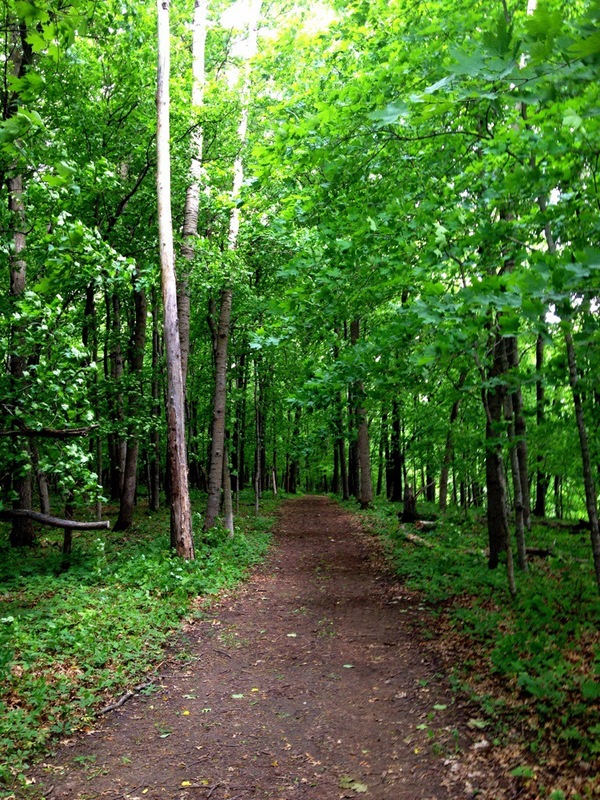 The woods were so beautiful. 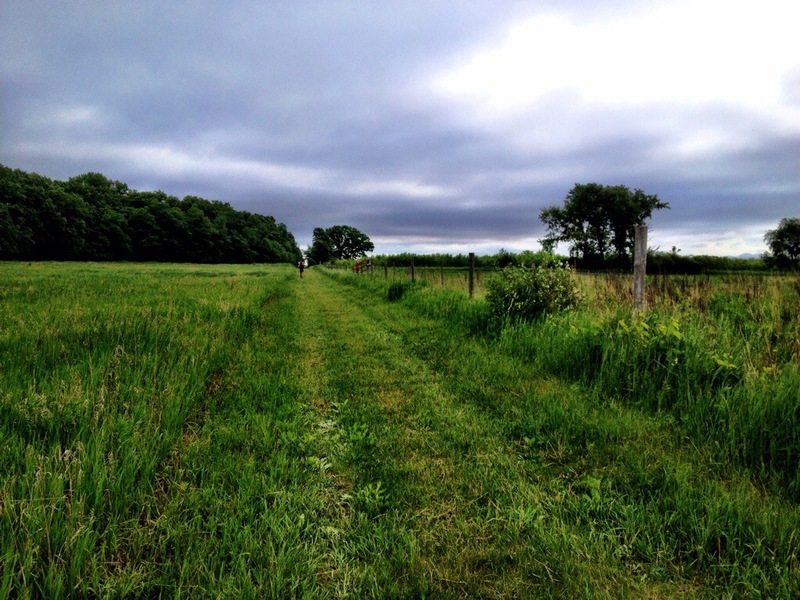 After running through the woods we ran through a small meadow section before entering into my favorite wooded section of the course. 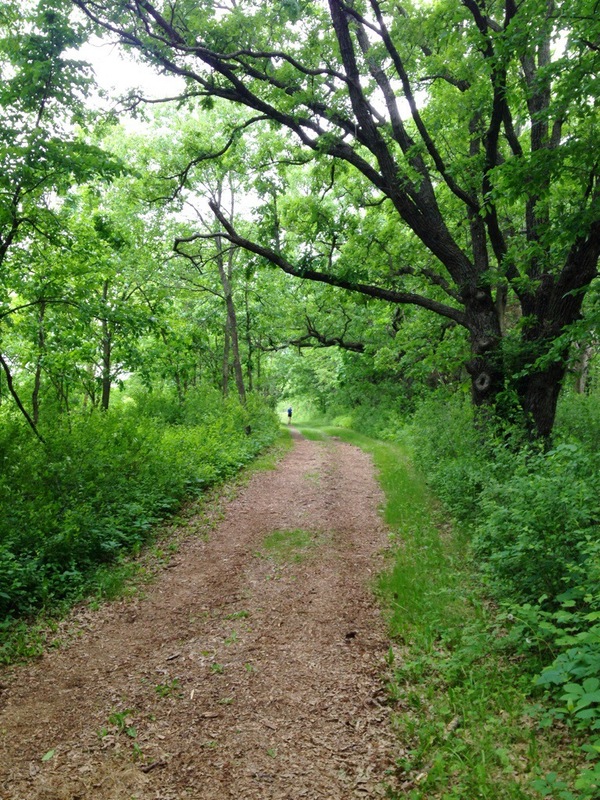 The canopy of trees engulfed the trail and it was like you were running into this other world. After the woods we headed out to another meadow section that included a sandy hill before heading back into the woods. Half of it is below. My hill strategy was to walk hills that were longer than ten feet. Most runners were walking hills to preserve their legs, too. In the words of a man on the course “I surrender to the hills.” Being a new trail runner I didn’t need to run a chain of mountains; these hills were enough but doable at the same time. Loop 3-Mile 23-The smile hides the sharp pain in my hip flexors. 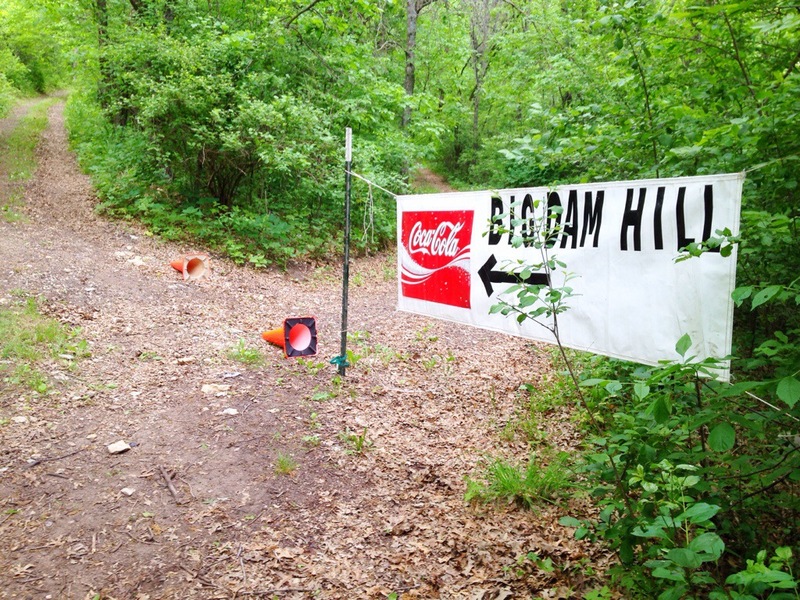 Next up on the loop was the Big Dam Hill. 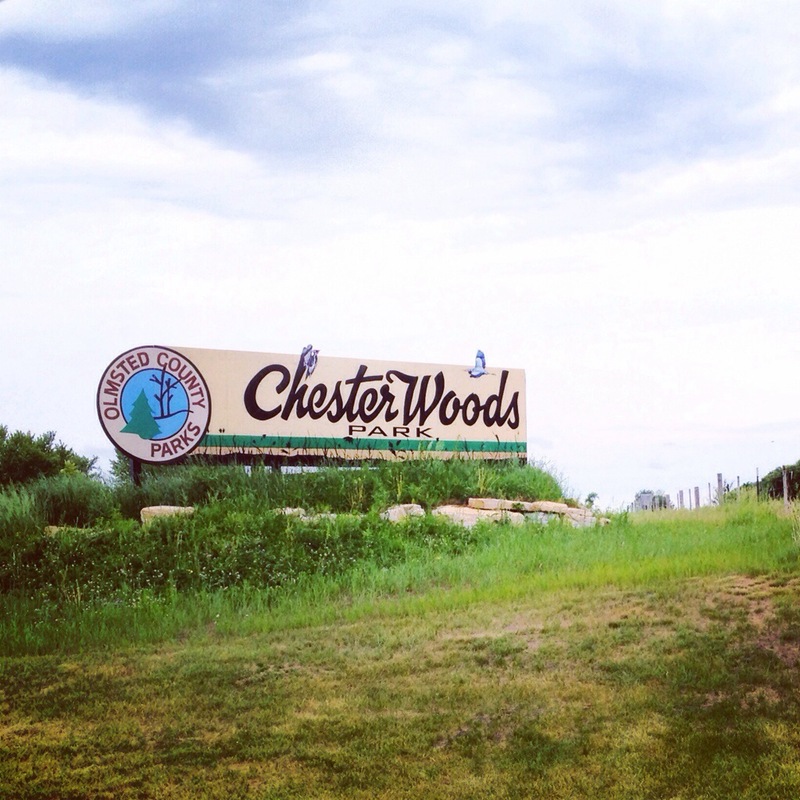 It ended at a beautiful overlook of the Chester Woods Lake reservoir. I loved how it was significant enough to have a name and everyone who ran the race before knew about the hill. Still climbing the Big Dam Hill-almost to the top. Most climbs are worth a view. This one didn’t disappoint either. I didn’t want to stop to take a quality picture so I’m borrowing one. Credit: http://www.rochestercvb.org. After the views of the lake from above we descended through a meadow to a small paved section of trail that joined a gravel and then dirt trail and ran along the lake. This view of the lake was gorgeous. 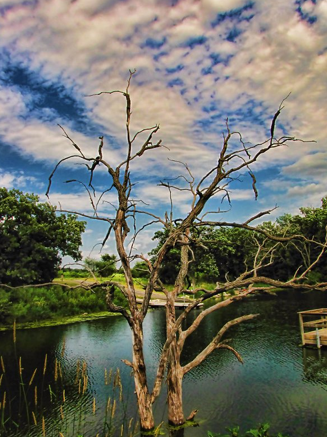 All kinds of trees stood out of the water. It was a lake of trees. From there we turned to repeat the loop two more time minus the first meadow section. The first loop was 12 miles and the second and third loops were 9.5 miles for a total of 31 miles. My Garmin registered a little short as I must have lost a half mile while in the woods at some points in the race. During the first loop I felt good. I was not in a fantastic mood, but it turned around as my body warmed up. 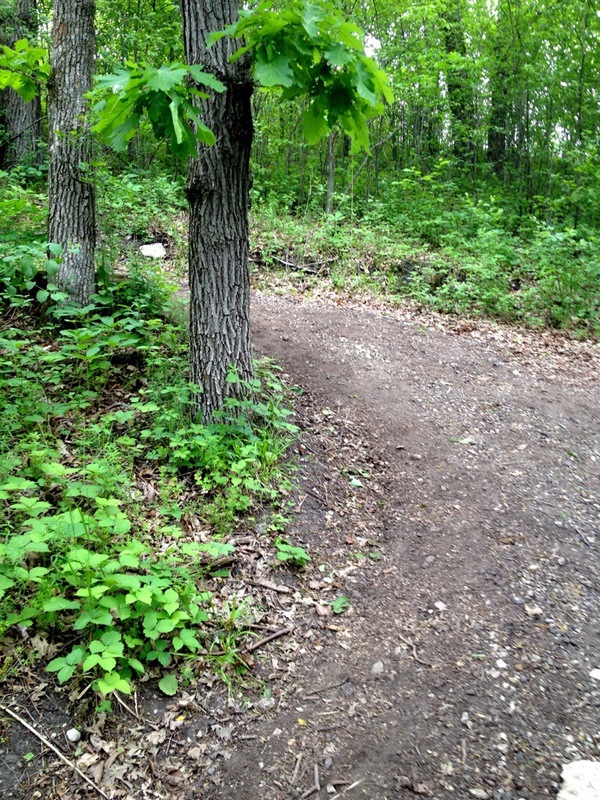 The second loop felt much faster and I was feeling great, too. Last Friday I traded a ten mile run for a 30 mile bike ride, Tuesday I ran almost six miles and I skipped my Thursday and Friday runs my training plan called for. I just didn’t feel like running. Most of my runs have been rough with dead leg feeling appearing during most my runs. I just wasn’t feeling fresh. I debated running Thursday and instead chose a night out with friends. Saturday’s second loop proved to me I’d made the right choice. My legs just needed some rest. At mile 20 I remember saying to myself that I couldn’t believe how good I felt both for being at mile 20 and in general. I felt great. At this point I was out of Gu’s having taken one at miles 5, 10, 14, and 18. I also didn’t want to waste time going to my car to get food as I stopped at the bathroom after the first and second loop losing four minutes or so from my time. I decided to grab food at aid stations since they had quite a selection. I grabbed Fig Newton’s and some pretzels from the friendly aid station volunteers when I was feeling low on fuel. Mention water and they grabbed your water bottle and happily filled it. They were so encouraging and helpful. Thanks volunteers! 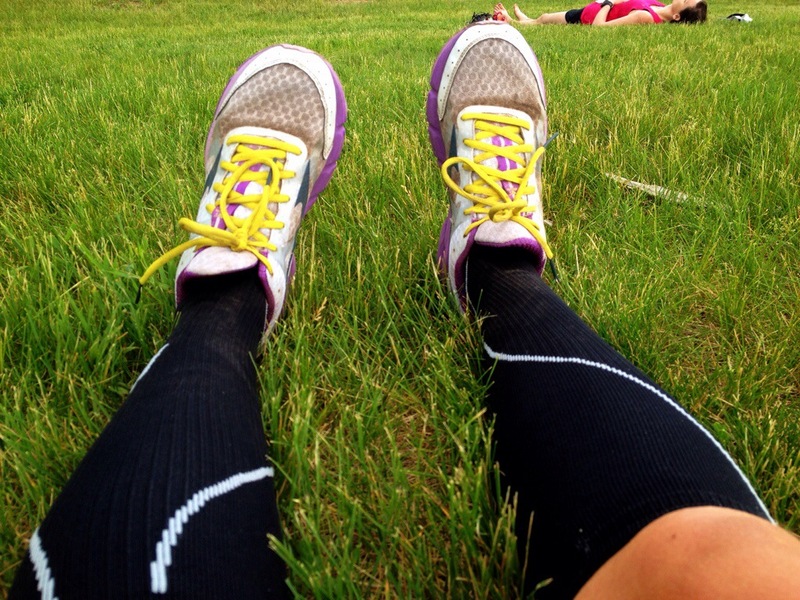 As lots of you probably have experienced, runs can take a turn for the worst at any mile. My feeling great changed soon after mile 20. Around mile 22 my hip flexors started to scream at me. Lifting my legs felt hard. My actual legs were feeling strong and alive. I seriously questioned if I was going to have to walk the rest of the course. 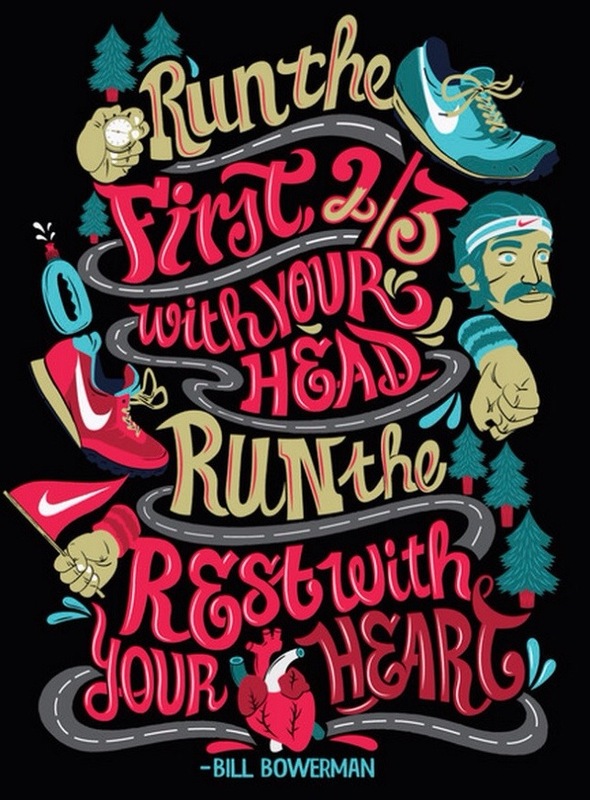 This is where you start to run the race with your heart. 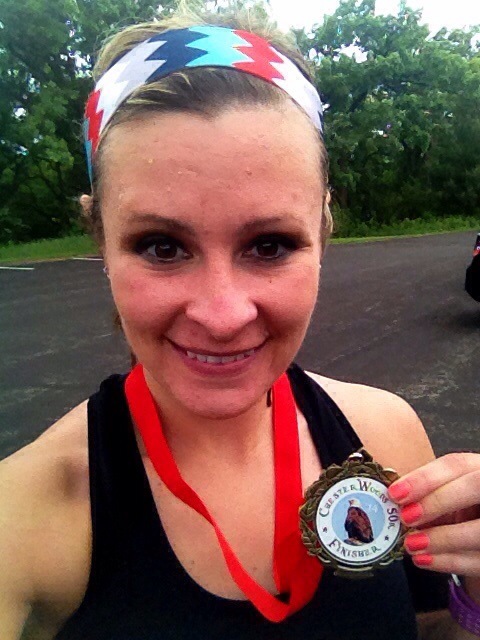 I pushed through and felt tears coming around mile 26, but was able to pull myself together. I don’t even know where the tears came from. 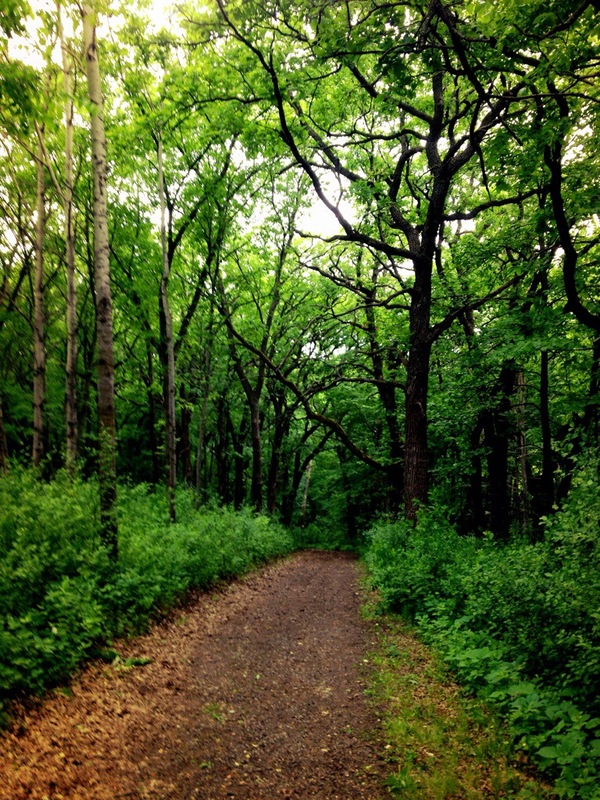 It wasn’t from pain, it was more of an emotional response to running for a long time alone in the woods. It was theraputic. Around mile 27 the pain in my hip flexors all but disappeared. 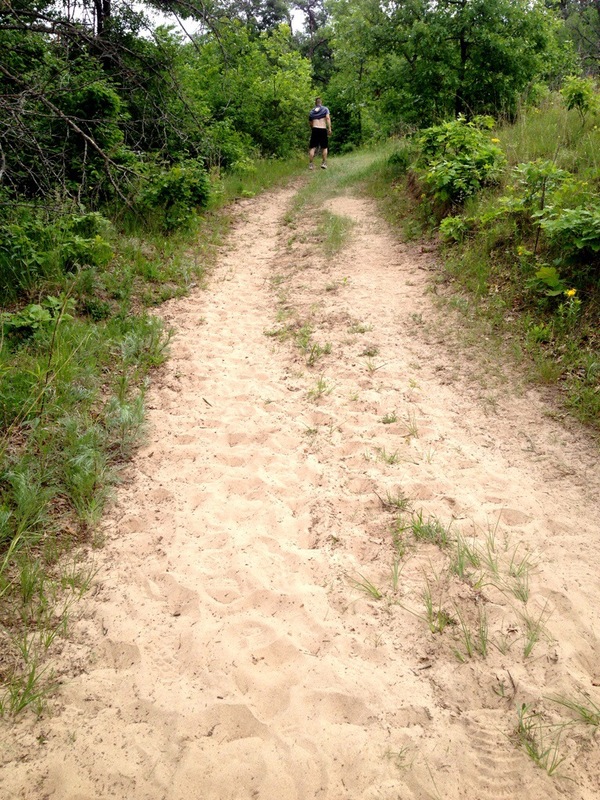 As I climbed the last sandy hill another guy told me “I was like a ninja.” That boosted my morale for a while. The last few miles I felt pretty good. I did a lot of self-talking and encouraging myself. I actually felt like I could run further than 31 miles. By mile 30 though I just wanted to be done. I’d been running for over five hours. My longest marathon time is 4:20 and my longest trail run had been 16 miles a few weeks earlier. I couldn’t wait for that finish line. When I did cross the finish line the feeling I remember more than tired or sore is proud. 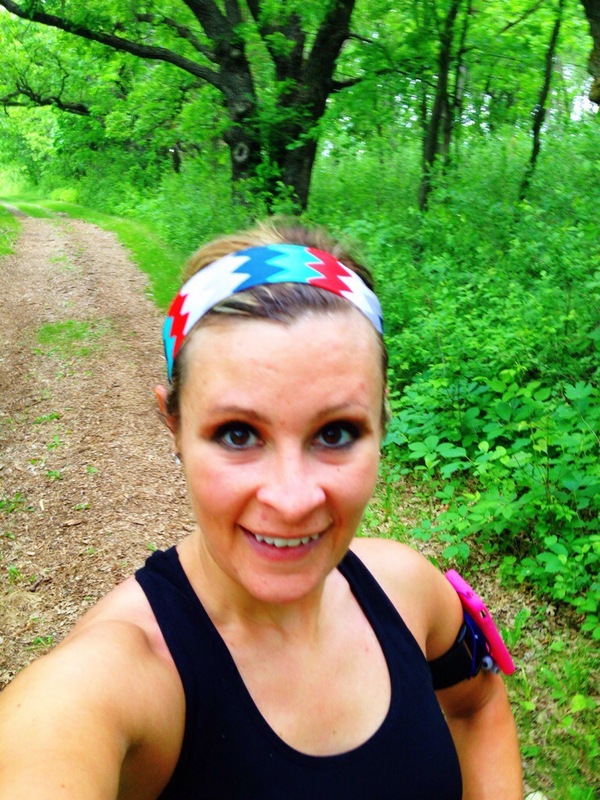 I was proud of myself for not only running 31 miles, but for also running on trails and with hills. As my first 50k I say it was a success and went much better than expected. This just proves we can do anything we set our minds out to do. 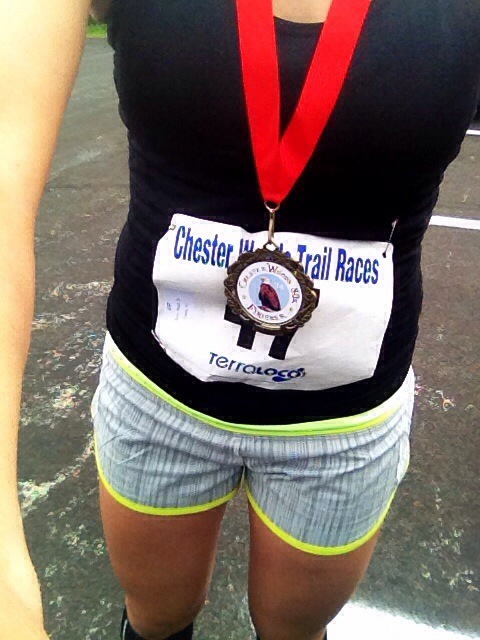 I loved the course at Chester Woods Park. The three loops was perfect for runners so they could restock items at their cars if they wanted. 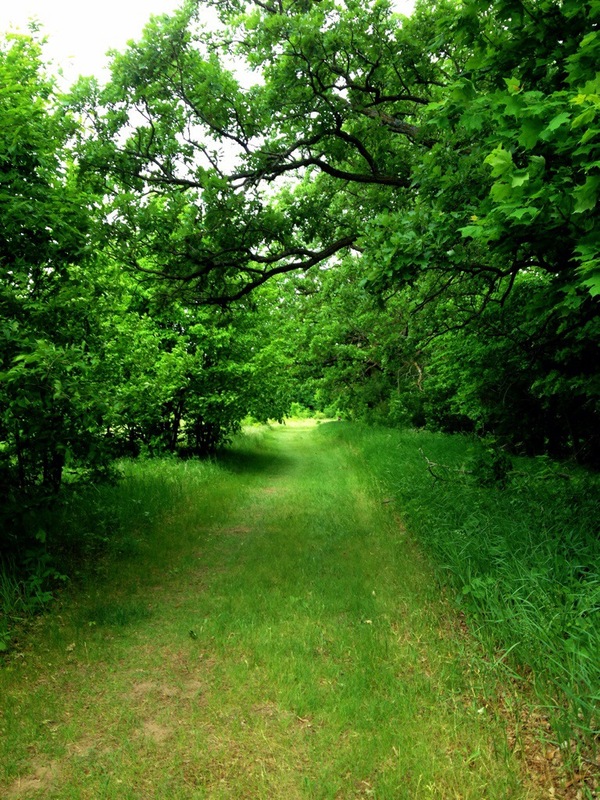 The course was a perfect combination of beautiful views, shaded woods and a little bit of meadows. I also loved the mix of terrains and that the hills were doable. I’m not ready to run mountains-yet? Or ever? During my last loop of the 50k I thought about my husband’s feelings about running another marathon (he’s saying one and done) and if I felt the same about a 50k or further. As of right now that is to be decided. I always say never say never. 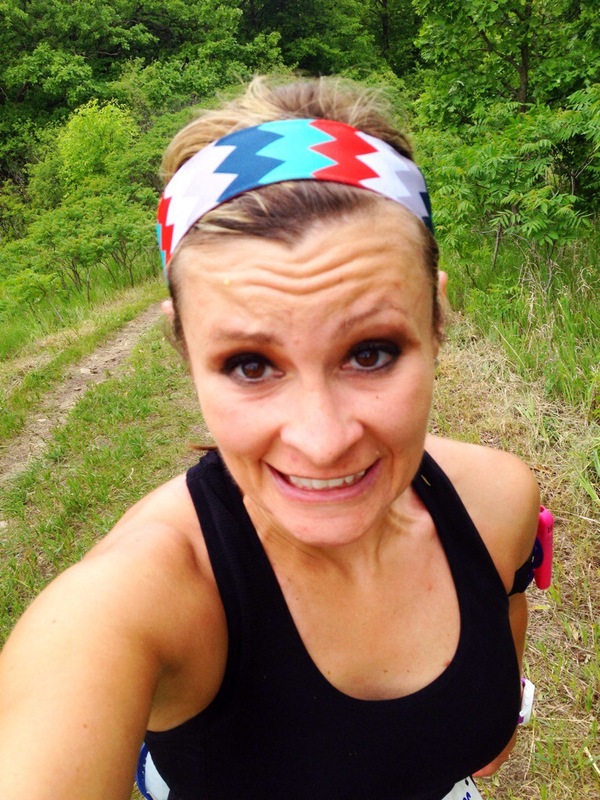 I came upon your blog quite by accident, looking to see if you could mix Gus and nuun during an ultra. Seems like you did just fine. I like your blog! Thank you. Thanks for stopping by (even if by accident)! I’ve found some blogs I love by accident, too. I usually had stomach issues when I mixed GU with Gatorade, Powerade, etc. When I starting drinking Nuun I found that eating GU’s with it has never bothered my stomach. When training for marathons I do combine Nuun and GU without issue. During road races I have GU’s and water. 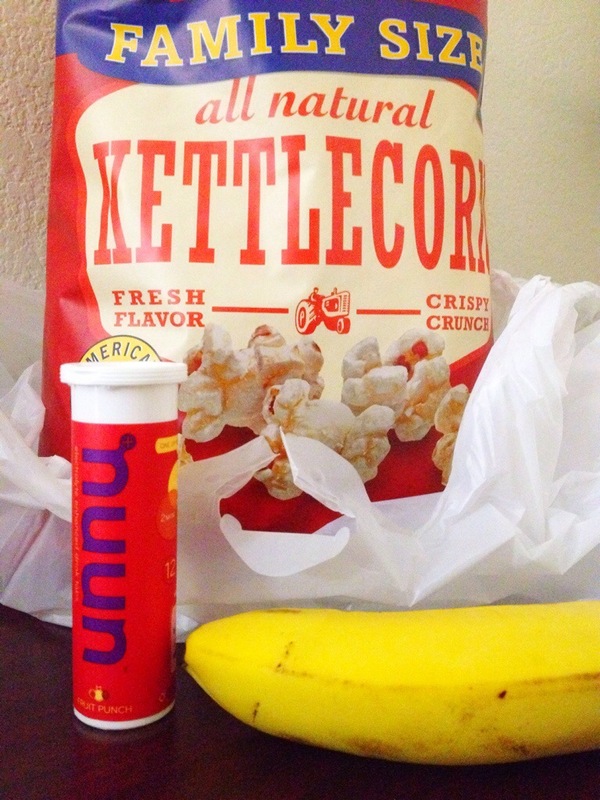 During my last trail race I had Nuun and water both along with GU’s and some real food. I had no stomach issues. 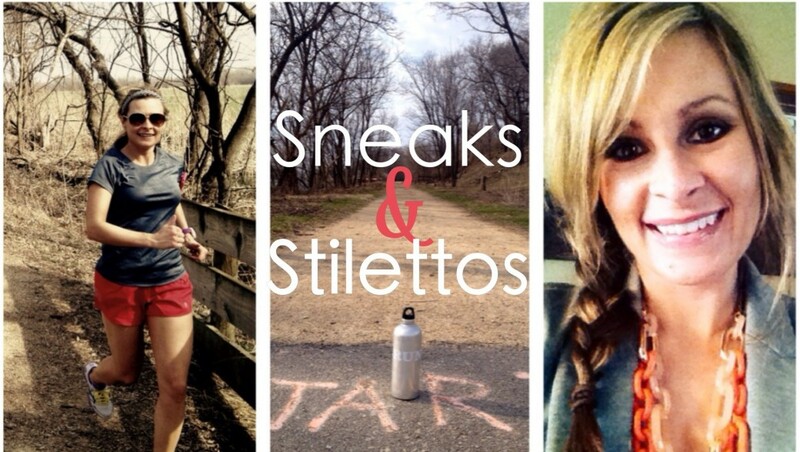 Obviously try it out on a long run or two to make sure this combo works for you! Good luck in your next race! CONGRATS!! This is so awesome!! !